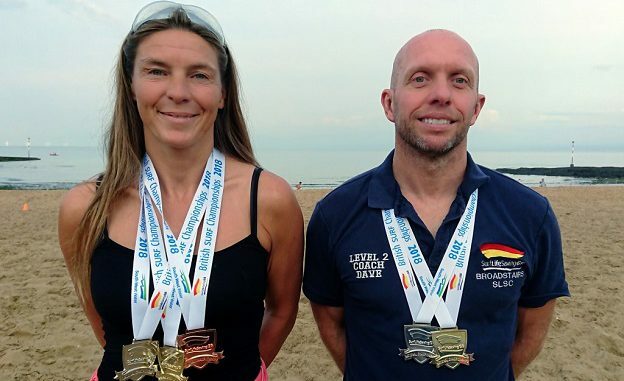 Broadstairs Surf Life Saving Club excelled at the beach in the National Masters’ Championship last weekend, bringing home two gold, two silver and a bronze medal. The team of just two athletes, Louise Tomlinson and Dave Bennett, were both in the 45-49 age group and took part in the two day festival of Surf Life Saving sport held at Holywell Bay in Cornwall, a round trip of almost 700 miles. The water events were held in 3 to 6 foot of surf with swim races, board races and surf ski kayak races, which can be challenging while swimming – diving under the largest of waves – and more challenging still on the 10’6” race boards or the 18’ surf ski kayaks. Water events start at the beach and head out through the breaking waves and then return to the shore to the finish line. The land-based events are in the soft sand of the beach, making running more energy sapping than usual. All the events mimic the real needs of lifeguards working on the beach where split seconds can make the difference between saving a casualty and not. The land events led to an early medal, with Louise getting a silver in her first event: the beach sprint – 80 metres across the soft sand – going through heats, semis and a final to get a silver medal. Meanwhile, Dave struggled in the water, having taken a year off competition through shoulder injury and surgery. He fell outside the points in the Surf swim and just missed a finals place in the board race having had bad luck catching a wave on the return to the shore. With a swap over from land to sea and vice versa, Dave took the next honours getting his own medal in the beach sprint – this time a gold. Louise got a creditable 5th place in the surf swim but elected not to do the board race with the large surf. The surf ski kayak races were also held in large surf, and Dave was held up by people who fell off, so was recalled before he even really got to the impact zone of breaking surf. The last races of the first day were the 1km sand runs. Dave set off with the lead pack, one of the few who ran the race barefoot, but struggled to stay with the eventual winner who pushed hard at 450m. He stayed with two other runners before pushing clear at 100m to claim a silver medal for the club. Louise worked hard throughout her 1km and was in a solid 3rd place from half-way through, picking up her second medal of the day – a bronze. The morning of the second day was shrouded in mist, so water events were cancelled until the visibility was good enough for competitors and safety teams. So, it was just the beach flags events for the pair. Dave gained a 6th place finish, but it was Louise who shone getting a gold medal by beating all comers in her age group. The large surf on that day meant that only the most experienced and best athletes attempted the water events in the afternoon, with the majority being the team events. The club were rightly pleased to have gained so many medals from the championship and competed in some very challenging conditions in the water. The club will hit the road in Suffolk in early September where athletes from age 8 upwards will be competing against other clubs in the Eastern Region of the UK.